The Panhellenic Association of Adapted Activities ALMA is a non-profitable non-governmental association founded in 1996 by professionals working in the field of learning disability. ALMA is officially registered in the National data base of the non governmental organizations under the supervision of the Ministry of Health and Social Solidarity. It also has Managerial Capability (no 2815/01.03.2011) for projects run by the National Strategic Reference Framework (NSRF).Our philosophy emphasises on the abilities of people with learning disabilities (mental retardation and autism) and on their full and dignified participation in the community. Our basic purpose is to present disabled people with opportunities for creative use of their spare time through a variety of integrated sport, cultural and leisure activities. One of our goals is to sensitize the community whereas comforting and supporting the families. ALMA is recruiting well-qualified specialists (psychologists, social worker, music therapist, drama therapist, instructors of physical education, special education teachers and occupational therapists) along with a team of trained volunteers to run the programmes and support the participants in all the activities. ALMA is also a member of the Free International Network and the International Caravan 2000. Horse Riding, Athletics, Track Sports, Swimming, Cycling, Bowling. 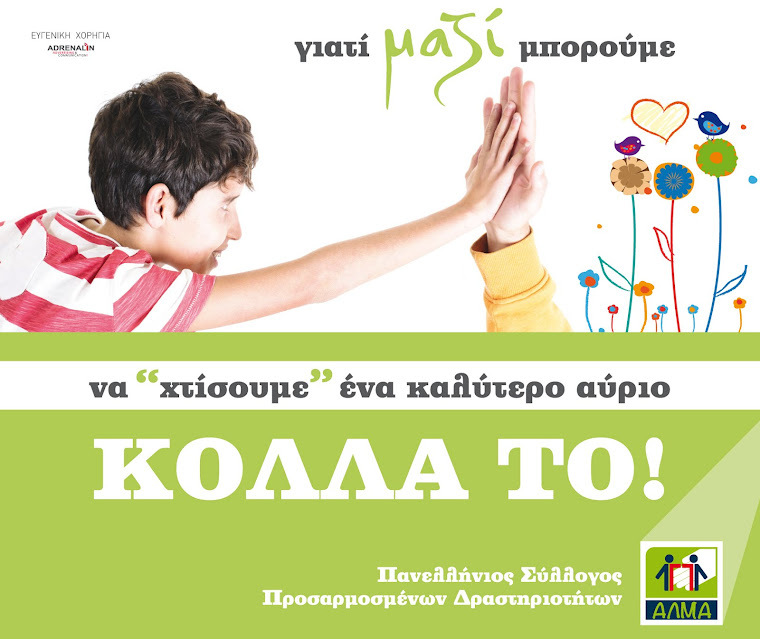 Projects for sensitization of the students of high schools and elementary schools towards people with mental disabilities in cooperation with the Municipality of Paleo Faliro. Recently we expand our programmes including children without mental disabilities in order to sensitize them through common activities. Projects for information and sensitization of the community towards people with learning disabilities through charity bazaars or athletic games for children with and without mental disabilities. “My Home” ,House of Supported Living in Paleo Faliro where 4 adults with mental disabilities live ,in a specially adapted house that meets the requirements of the Ministry of Health. Become volunteer in our events or our programmes! Come and help us in our bazaars with your friends! Bring your presents for our charity lottery! Adopt an activity or a programme and fund it for the whole season or just a part of it! ask us what we need! definitely your smile and love!